Thirty weeks, thirty original weekly short stories, AND a free book. 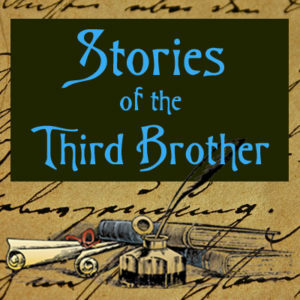 Join the online series of the Stories of the Third Brother: get a weekly story each week for thirty weeks, AND we’ll send you a free print or ebook (your choice) when we publish the whole collection of 30+ tales. 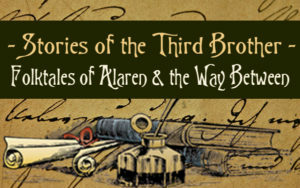 The Stories of the Third Brother are fictional folktales about Alaren and the Way Between. Inspired by true stories of active nonviolence and waging peace, each tale is enjoyable for people of all ages. Delivered once a week in a serialized e-format, these stand-alone stories are also great companions to Ari Ara’s stories. 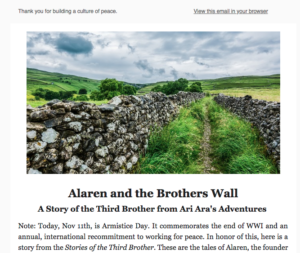 Each folktale comes with a “real-life inspiration” referencing a piece of nonviolent history that lifts fiction off the page and into our lives! 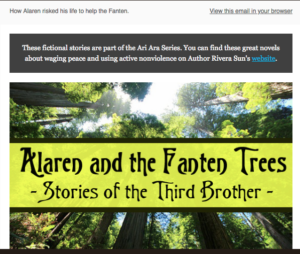 Rivera Sun adds commentary on the stories (fictional and historical) and each email includes eye-catching images. A fun and unique way to learn nonviolent history, practical tactics for peace, and the lineage of peacebuilders and nonviolent activists, the stories draw inspiration from: Gandhi‘s Salt & Spinning Wheel, Women of Liberia Mass Action for Peace, Christmas Day Ceasefire, Chipko Movement – the Original Treehuggers, White Rose’s Pamphlet Drop to Counter Nazism, Beat Your Swords Into Plowshares – Isaiah, Truth & Reconciliation in South Africa & Beyond, Restorative Justice Practices, Unarmed Peacekeeping in South Sudan, Fall of the Berlin Wall, Creative Peace & Anti-war Protests, Underground Railroad, Indigenous Treaty Rights Struggles, Columbia Peace Communities, Badshah Khan‘s Peace Army, Thich Nhat Hanh‘s “Lotus In a Sea of Fire”, Mother Jones & the Children’s March, Icelandic Women’s Strike, Czechoslovakia’s Velvet Revolution, and more! In the Stony Pass, north of the East-West Road, the two kings Marin and Shirar were building a wall. Two walls, in fact, because the kings were brothers and mortal enemies, and neither would cooperate with the other on anything – even on building a wall in the exact same spot. Stone for stone, back to back, the two walls rose like twin serpents through the border pass. Read the rest here. Do I need to have read the Ari Ara books? Nope. You’ll love these stand alone tales. But if you have read The Way Between or The Lost Heir, you’ll love the “backstory” and context these tales provide. Who is Alaren? Alaren is a fictional folk hero from Ari Ara’s world. He is one of the Three Brothers (Marin, Shirar, and Alaren) who founded the nations of Mariana and the Desert. His brothers fought and warred constantly, and Alaren sought peace and justice. He used the Way Between (what we might call nonviolence, peacebuilding, and conflict management skills) to work for the well-being of all. Did I already miss stories? No. The series begins when you subscribe and sends you the second story on the following Saturday. Can I share one of these stories with a friend? Yes. Each story has a social share button and an opportunity for your friend to subscribe to the series, too. Where can I get The Lost Heir and The Way Between? Thanks for asking. You can find the newest editions through our Community Publishing Campaign until Dec 19th, 2018, or you can find the original first edition of The Way Between on our online store. Can I sign someone else up for the series? Email Rivera about it via our Contact Us page. You’ll need to get the other person’s permission. Why are there 30+ stories in the book and 30 in the series? Because Rivera is writing more stories even as you read this. All of them will go into the final book, but not all are ready for the email series at this time. Will my kids like this? Yes! And so will your grandmother. I know mine does.